On Monday, during a big cat "training session" show at the Oregon Zoo, a lion named Zawadi was injured while a crowd of children looked on. Footage of the shocking incident shows Zawadi entering the indoor stage through a hydraulic door, which then proceeds to shut with him still underneath - chopping off the tip of his tail like a guillotine. "His tail is bleeding a lot!" 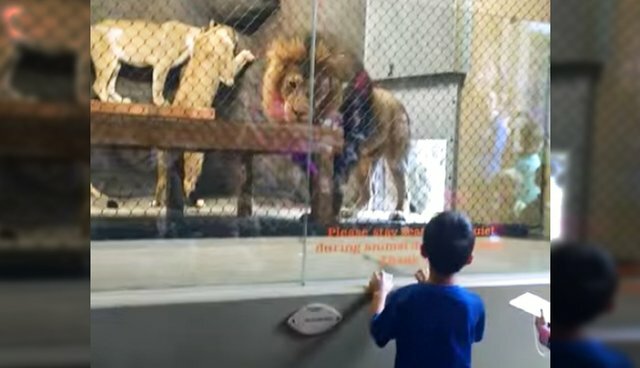 "Witnessed a crappy accident today that injured a lion today at the zoo," attendee Brandon Geer, who recorded the video above, wrote on YouTube. "Part of his tail is gone, blood puddling." The zoo later issued a statement regarding the incident, seeming to downplay the severity of what had happened to Zawadi. "He lost the tip of his tail just above the tuft," zoo veterinarian Tim Storms said in a release. "For a 450-pound lion, that's a relatively small injury, but we are treating it seriously. After a brief medical procedure he is recovering well. We expect him to heal without any complications." Zoo officials are reportedly reviewing what happened, but this isn't the first time hydraulic doors have proven dangerous to zoo animals. In 2014, a baby gorilla at the San Francisco Zoo was crushed to death by the device - prompting critics to urge other facilities to take precautions. "There should be a system in place to make sure this doesn't happen again," Elliot Katz, founder of In Defense of Animals, told SFGATE. "It's just another tragedy waiting to happen. It always takes something like this to have people wake up."